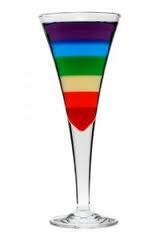 Pousse Cafe #2 drink recipe made with Creme de Menthe,Creme Yvette,Grenadine,Yellow Chartreuse,. How to make a Pousse Cafe #2 with all the instructions and ingredients. Into a Pousse Cafe glass, carefully pour equal parts of the above ingredient s in order shown so that each ingredient floats on top of preceding one. Pour each liquid over the back of a spoon resting on top of the glass. Slimer #2 View This Recipe! Port And Starboard View This Recipe!